Miss B has decided that we should play through the pile of Lego games that we have accumulated over the last couple of years and then write a post comparing them, and I think that is a most excellent idea. We have played some of them, but a couple of them have remained in shrinkwrap, so I’m well up for trying them out. I guess what we’ll do is give a load of them a go and write regular reports as seems appropriate, then at some point we’ll have an overview post. A few days ago we had a go at Frog Rush, which we covered ages ago, but now we have tried the new-to-us Ramses Pyramid. Nearly to the top, we’ve avoided the mummies, and blue gets a burst of speed. So this is a game designed by the ultra-prolific Reiner Knizia, known for some of the most subtle and elegant games out there, as well as for banging out simple little games for the toy market. I was under no illusions that this would be the next Tigris & Euphrates or Modern Art, but who cares: this is Lego. With these games you get to build the board, and if the game is a real stinker, you still have a pile of Lego for the collection. As a result, Miss B and I had a nice pre-bedtime activity together of constructing a really cool pyramid with layers that could easily be removed and replaced with different orientation. Neat. The next evening we got to actually play the game. The idea is that your adventurer runs around the base of the pyramid collecting gems and getting information about the location of additional gems in secret “temples” (effectively little cases that you can’t see into), then climbs the steps of the pyramid, dodging mummies that cascade down causing chaos, and then confront Ramses, the king of the mummies, to claim his crown. Each step on each side of the pyramid has a coloured gem on it, and you can only climb to that step if you are holding, or can remember the location of a matching gem. This is all pretty cute, but turns out to be pretty trivial. Even the memory aspect of the game doesn’t really amount to much. But we had fun playing it, and it wasn’t as fiddly as some of the other Lego games we’ve come across. And it looks totally awesome, with great design from the Lego construction side of things. I mean, the way the layers of the pyramid move is stunning. I think that, when playing through the rest of the Lego games, what I’m looking forward to the most is the building. We have one more of the big box games, and that should be fun to construct, and I’m sure there’ll be some amusement from the others too. 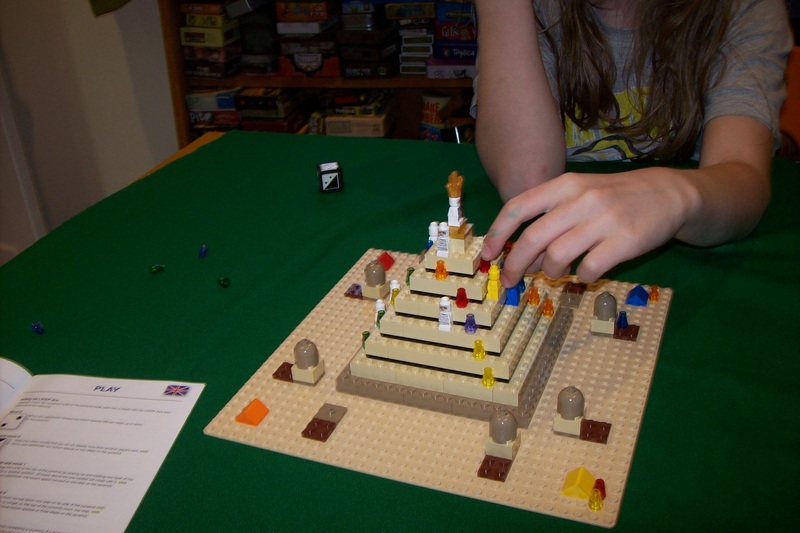 The game: Ramses Pyramid (Lego), 2 to 4 players aged 8+. I think most folks who play boardgames as a hobby will have come across the name of Reiner Knizia. He is possibly the most prolific game designer in history, and we have already written here about a few of his games: The Hobbit, Heckmeck and, one of our favourites, Loot. He has a reputation for games that are slick and abstract, generally with a pasted on theme. 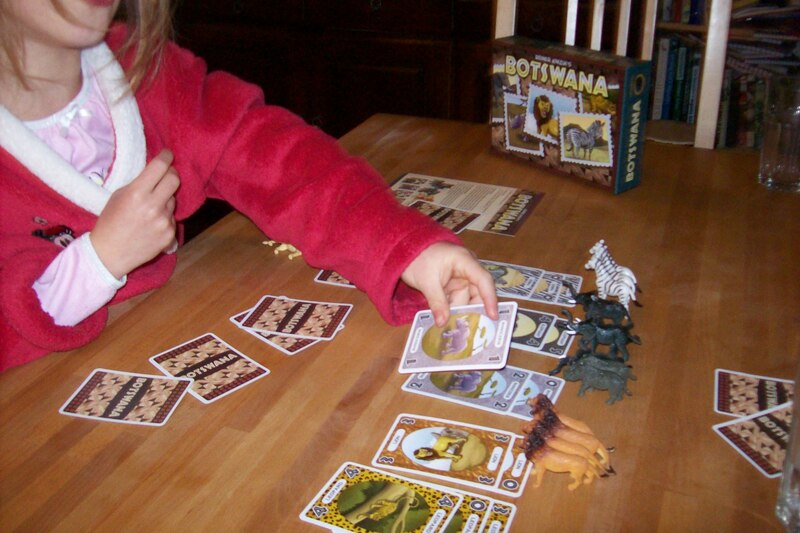 The latest game of his we have tried is Botswana, which is true to form in that it has a wafer thin theme, but it has a special, secret ingredient that lifts it to a new level: loads of toy animals. If you don’t like the game, you can play at zoos. The game plays quickly and easily. You explore the landscape of Botswana, seeking out animals to shoot spot by… umm… playing cards with numbers and pictures of the animals on. Then you get to add one of those cute toy animals to your collection. At the end of the game, each animal you own is worth points equal to the value of the most recently played card depicting that animal. That is the whole of the game. In our first session, we had a two player game with just Miss B and I, then we were joined for another by S, who enjoyed playing. Miss B did OK, but said that we should play on another occasion before she made up her mind about it. This was clearly not a bad game in her eyes, but probably not great either. It is worth pointing out, however, the importance of ensuring, while setting up, that the zebras are separated from any predators in the area by a group of pachyderms which can prevent things turning nasty. Luckily we now have a system for ensuring this. We have now had another go at the game and it went quickly and easily. I won both of the hands we played but the scores were close enough for there to be a little tension and Miss B was all smiles at the end of it. To be played well, Botswana needs some planning ahead and occasionally bluffing, which doesn’t come particularly naturally to this six-year-old, but it still works well as a light game. I think the game’s biggest problem is that you deal out all the cards at the start of the game. 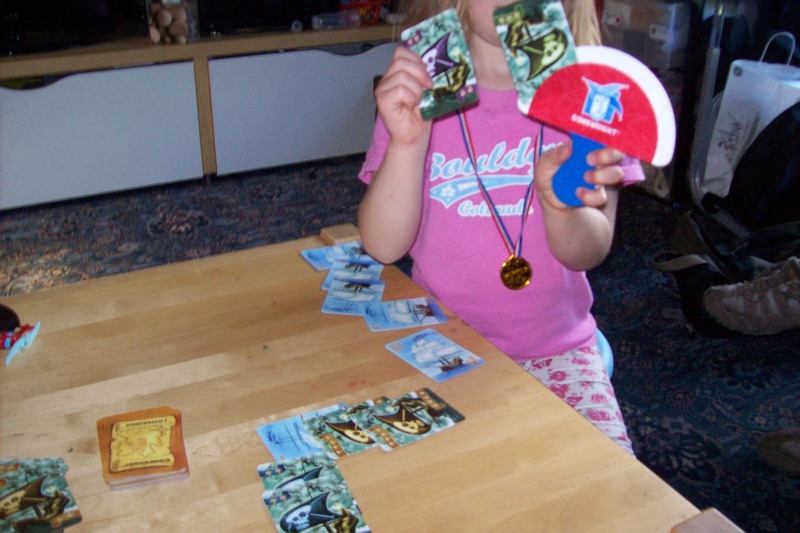 In a two-player game this means that you have a starting hand of 14 cards (too much even for effective use of the card holder we have), which is awkward for little hands and hence Miss B was making face-down piles of cards on the table and looking through them on her turn. The number of cards in hand goes down quickly, so the problem reduces. I reckon this is probably going to find its way into semi-regular play. 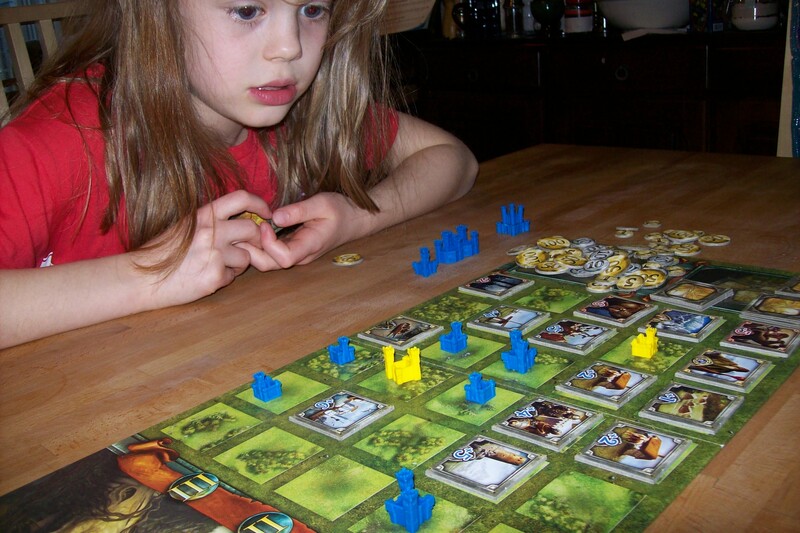 The game: Botswana (Gryphon Games), 2 to 5 players aged 7+. There are an awful lot of games based on JRR Tolkien’s works and a lot of them are awful. I don’t know half of them half as well as I should like; and I like less than half of them half as well as they deserve. Or something like that. Anyway, we have been playing a game called The Hobbit, which is one of a few with the same title. I know of one such game that has a huge dragon in the middle of the board. This is not that one. This game is by Reiner Knizia and has Smaug the dragon at one end of the board and Bilbo the hobbit at the other, and you need to get Bilbo to Smaug’s lair before Smaug gets to Laketown. All clear? Good. Getting low on provisions but valiantly doing battle with wargs nonetheless. I’ll come out and say it straight away: the rulebook for this game is a jumbled mess which spends more time (incorrectly) summarising the plot of the book (the Arkenstone is not a cup, for crying out loud!) than clearly explaining the rules. Still, we figured it out and got playing. Once you are past the none-too-great explanations I actually reckon the game is quite good. Basically, part of the game is travelling to the next of four key locations, during which time you bid to accumulate provisions, develop skills, and acquire special items. 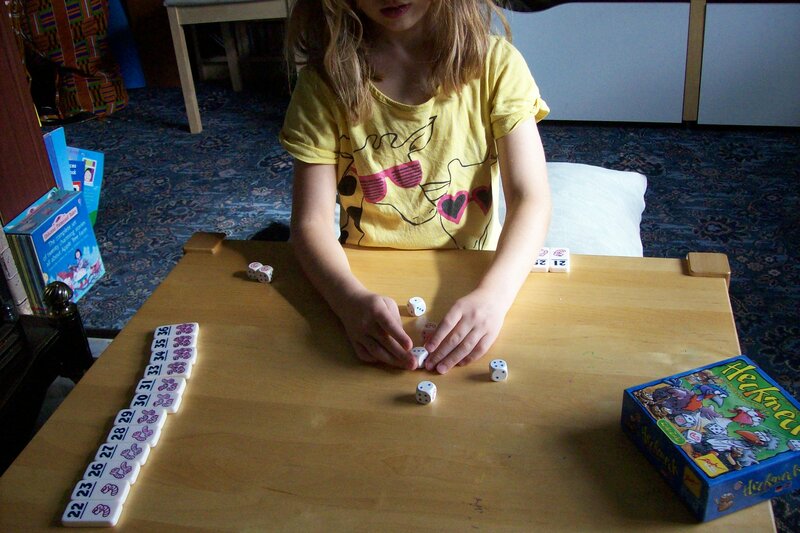 On arrival at the locations you undertake a series of adventures which involve rolling dice in a simple sub-game. Cards get turned over at each step which reveal what is going on and give a little flavour from the book. Miss B loved the flavour text on the cards, and we had to read each section out when it came up, which led to her commenting occasionally on how we were encountering things out of order (we read the book together last year). The aim of collecting treasure throughout the game seems to miss the theme a little, but it all seemed to work out OK, and it did feel like we were going on an adventure together. All in all I think this went really well, despite it taking us well over an hour to play. I expect the game to come out again from time to time, though I’m thinking a bit about making a small tweak to turn this into a proper cooperative game with increased difficulty. We do have friends possessing one of the aforementioned other Hobbit games, so Miss B is hoping to try that one some time so she can decide which she likes the best. Looking forward to that. 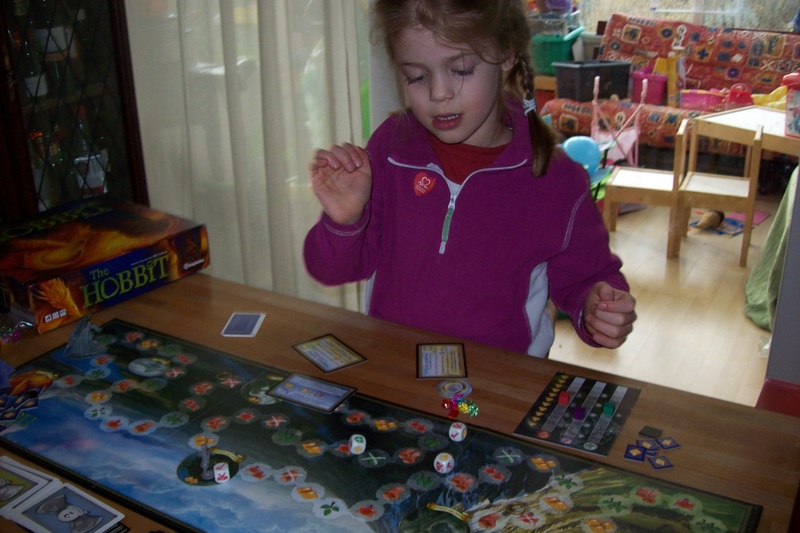 The game: The Hobbit (Imagination), 2 to 5 players aged 10+. Two worms, not a bad start! I only actually heard about Heckmeck am Bratwurmeck (aka Pickomino)a few weeks ago and it sounded just OK, but when I found a copy going very cheap I thought I might as well pick it up. It turns out that it’s a pretty decent “push your luck” type dice game with the bonus that the scoring is by collecting domino-like tiles which have a lovely touchy-feely-ness to them. The game is from the same range as “By Golly!”, which we played a while back, and the game artwork features the same Doris Matthaeus illustrated chickens (the “Zoch Chickens”). So we’ve played the game a few times now and it works well as long as you don’t wait until all the tiles are claimed in order to end the game. That way madness lies. We have settled on to playing until ten tiles are gone, then everyone has one last go. Updated (2012-08-26): Actually, it turns out that I misread the rules and you don’t have to play for all the high value tiles before the game can end, so this game is better than I thought. Apologies to Herr Knizia. I like this game far more than I thought I would. Though I must admit that I am generally a sucker for Reiner Knizia games — they are often criticised for being very light on theme, but in most cases, the gameplay is so elegant that I really don’t care. Miss B quickly got the hang of the game and started enjoying herself. Come to think of it, what’s not to like about rolling a fistful of eight dice? In the early games I was giving quite a few pointers on which dice are best to keep, but now that isn’t really needed. Miss B doesn’t know anything about probability, but she does have a pretty good feel for the game and has even won a couple of times. I’m actually looking forward to using this one as a filler in an adult gaming session. I think it would work well in that context. The game: Heckmeck am Bratwurmeck (Zoch), 2 to 7 players aged 8+.